Machines A, B, C, and D left to right, bottom to top. Top to bottom: B, A/D (C has a ribbon cover from another machine, but is the crinkle paint variety). 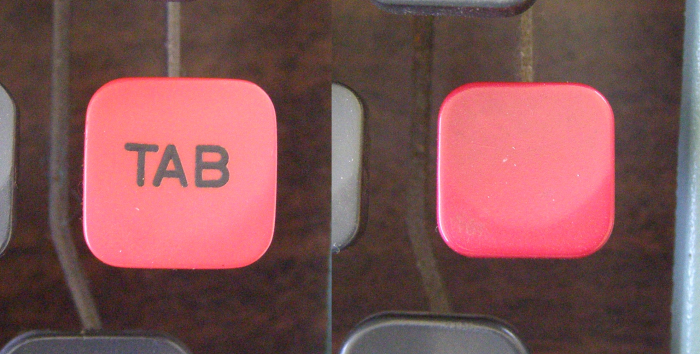 The ones made in Spain have labeled Tab keys, but the Italy made ones do not. 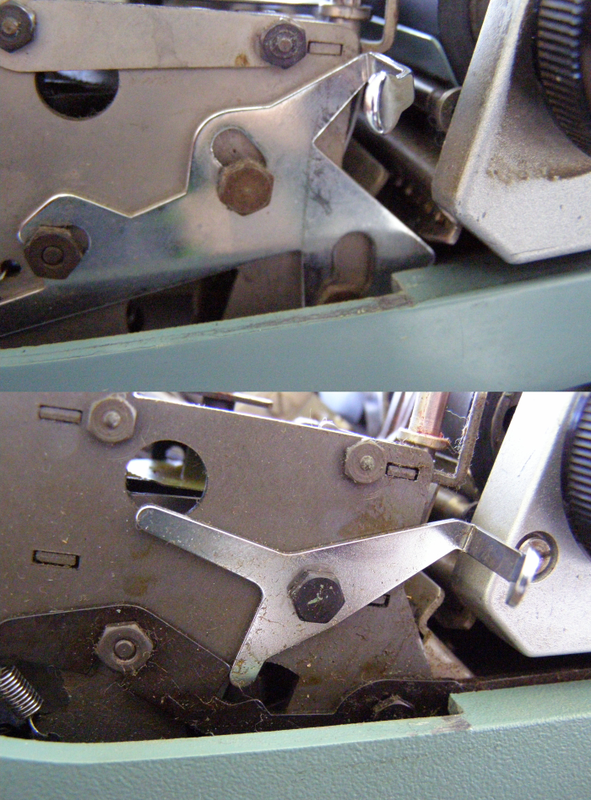 Top you see what most Olivettis have, bottom is the mechanism on machine B, the earliest example. This design is better I think than the newer machines. 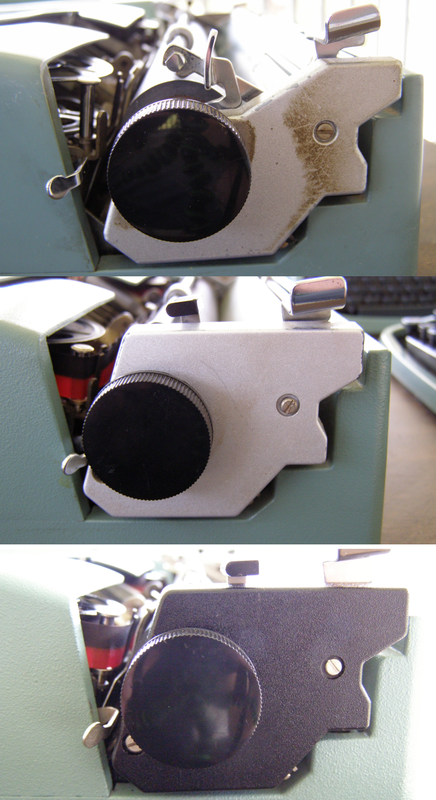 Top is machine B, the better design with one moving piece on the carriage lock. The others are all the bottom which has two moving parts and does not work as well. Nice post. 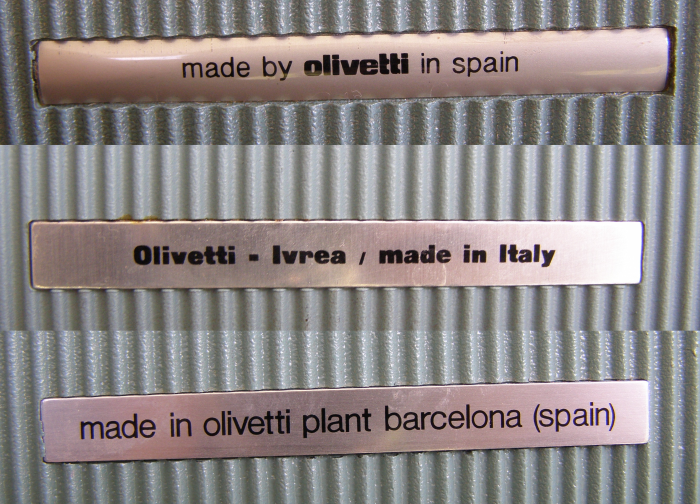 :) I'm always curious about how Spanish and Italian Olivettis differ. Would you say that the two Italian-made ones are better than the Spanish ones? My Italians are older than the Spanish ones, so I do not know if they are different because of nationality or age. I can tell you the two older Italians are tighter than the newer Spanish ones which have a loose and flakey feel which is not entirely bad. Interesting comparisons. The side of the carriage on Machine B is like that on Ivrea-made Lettera 22s, which are different to that on my Glasgow-made Lettera 22 (and probably the Spanish-made '22s). So it seems the '22s had similar variations. 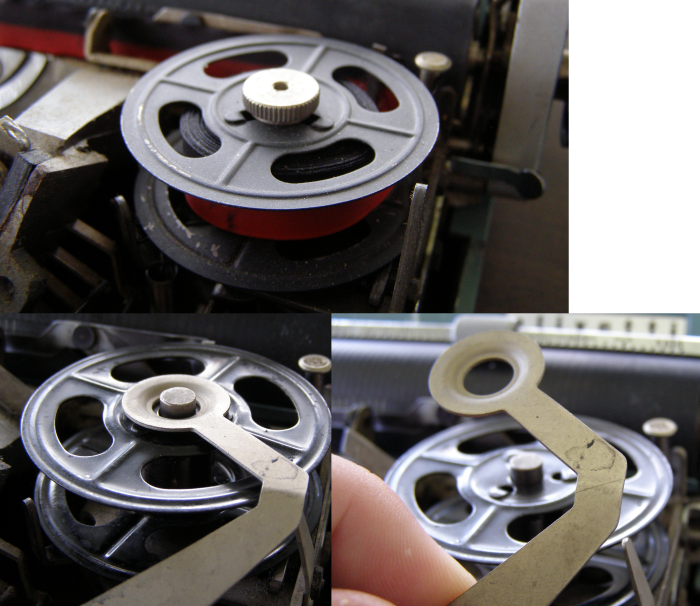 I have a Spanish '32 like your machine A.
I wonder whether any 22s had the odd ribbon retainers on my machine B. That's very interesting, thanks for posting this. You might be interested in an old post of mine if you haven't seen it already. So you have an early 32 judging by the end of the carriage, but you have the screws still for the ribbon spools. What I want to know more about are the spring-loaded flaps on mine. Good post, thanks for linking. I think I do remember seeing it before but I know more now and it was much more interesting to look at the pictures. Those ribbon spool clips are entirely new to me. All my portable, semi-portable and standard Olivettis have screwtops, so thanks for an insightful comparison. Just discovered your blog - thank you! 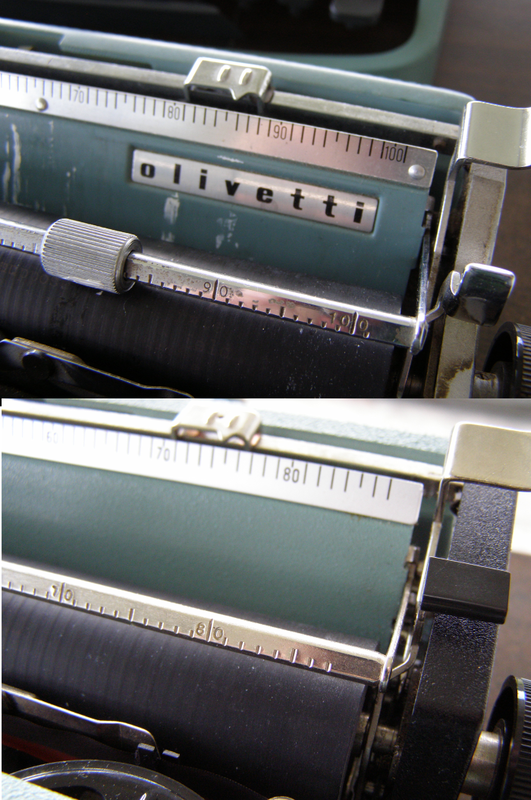 So do you like these Olivetti's? I've only had one and was pretty much unimpressed with it, so I don't look for them. Seems they got pretty cheap in latter years. I love them, and I think the newer ones are actually better to type on. They feel a little flakey/cheap, but that makes them faster I think. wonderful post! 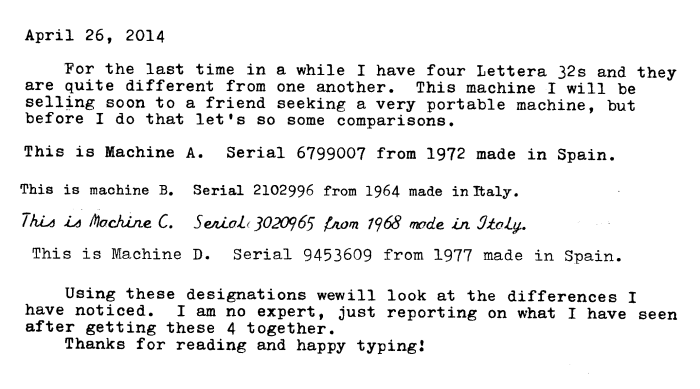 the first typewriter I got was a lettera 32, made in spain. 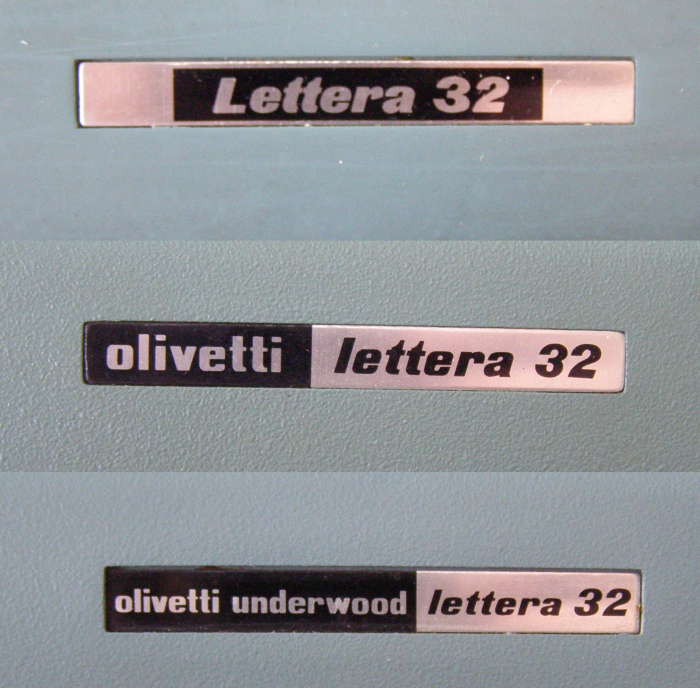 ive been on the lookout for one made in Italy bc I preferred that it said lettera 32 on the front rather than Olivetti lettera 32. it also has the crinkle paint and im pretty sure it has the Olivetti logo on the ribbon cover. ill have to dig it out to check. I haven't used it ever :( ive been meaning to restring its mainstring and keep putting it off. I do use my lettera 22s and have gathered that the 32s have a more solid base, obviously since its a bigger heavier machine. Once again great post - good to see these compared! I have an Olivetti Lettera 32, and the Y and Z keys are reversed. Also, there are three or four unique character keys. Can you give me any information on this typewriter? It sounds like it is probably German. I'd have to see a photo of the keyboard.